“My story is like many other women I know – the mirror has lied, and the enemy has whispered for years, and now we can’t look at ourselves and find anything lovely…,” Annie F. Downs. Published by B&H Books, Looking for Lovely: Collecting the Moments That Matter by Annie F. Downs is a good read with a powerful message for women. Downs shares her personal story of brokenness and her journey to healing by learning to learn to love life and find purpose in pain. She writes with vulnerability and transparency. 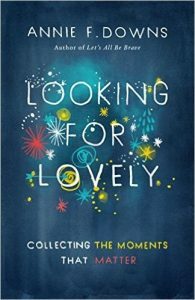 She encourages readers to view life with fresh eyes to gain a new perspective. Downs’ writing style makes you feel like you’re sitting across the table, having lunch while engrossed in a deep conversation. The book is separated into three distinct sections. In Section 2, Downs recounts her journey to recovery. In what is written as a series of short stories, she recounts how God helped her rebuild her life from the “broken crazy.” This wasn’t my favorite section of the book, but the overall theme is what is important. She finds beauty in the mundane, ordinary moments of life. She learns to appreciate the things God has placed in her everyday life – things that make her feel alive. It may be a place, an activity, a group of friends, a style of music or a favorite food. She gives herself permission to enjoy life – a good lesson for us all. “I’m filling my mind and eyes and memories with good things, good gifts from God, so that my tank is refueled,” she writes. While any woman would benefit from the principles in the book, the style and content will appeal to younger women. The book would be most beneficial to young women experiencing a difficult season of life. It’s a quick, easy read and one that will inspire women to strive to be all they can be. Downs will be one of the keynote speakers at the 2017 BGCO Women’s Retreat at Falls Creek Baptist Conference Center in April 2017.